RELIABLE BRAND: Since 2013, Homestarry has developed into one of the most popular brands in decorative lights category. TERRIFIC BATTERY LIGHTS: Equipped with 16.4 feet moldable copper wires and 50 pcs glowing micro LEDs, and handy remotes to realize wireless control. Awesome lights for decorating wedding ceremony, Halloween party, dinner party centerpiece, crafting projects, DIY jars, twinkling bonsai, plants arrangement. HANDY REMOTE: 8 lighting modes and 10 brightness levels to create ideal ambience; a simple click on TIMER to turn on/off the lights automatically. IP44 WATERPROOF: Totally waterproof strings and bulbs, IP 44 waterproof battery case are all designed to use outdoors, feel free to put the whole part except for battery case under fountain to create amazing scene. 2 in 1 PACKAGE: 3 AA batteries(excluded) are required for each set, one piece of CR2025 battery(included) for each remote. 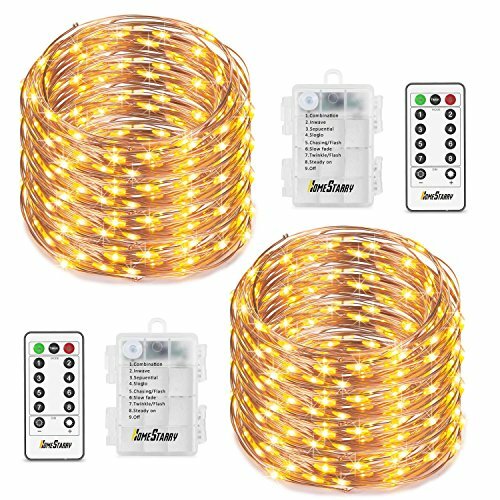 TERRIFIC BATTERY LIGHTS: Equipped with 16.4 feet mold able copper wires and 50 pcs glowing micro LEDs, and handy remotes to realize wireless control. Awesome lights for decorating wedding ceremony, Halloween party, dinner party centerpiece, crafting projects, DIY jars, Valentine's Day,Valentines lights, twinkling bonsai, plants arrangement.